When I was asked to be one of the two guest birders for the “Bi-Coastal” version of the Baillie Birdathon this year I spent a few seconds deciding on my strategy. The overall goal was to maximize the number of combined species between my Birdathon in British Columbia and Blake Maybank’s in Nova Scotia. Should I concentrate only on western species that Blake couldn’t find out east, or should I just try to see as many different birds as possible? I knew right away that I would use the latter approach, especially since my son Russell had recently beaten my one-day record for the number of bird species seen in one day in British Columbia. Last year Russell had put together a team that found 197 species in one day, one more than my record set in 1995 (coincidentally, one of my team members in 1995 was Blake Maybank). So, in the interest of family unity, I asked Russell if he’d like to be on my team this year. He instantly said yes, and after a bit of planning we decided to add two coast-based birders, Pete Davidson and Nathan Hentze. Our simple goal—200 species in one day. Midnight on May 18th found the four of us huddled in my car on a back road in the farmlands north of Kelowna. The stars were all aligned for a good day—after weeks of cold rain, the weather forecast was for clear skies and calm winds. An almost-full moon rose over the barn behind us—that might be a great help in finding songbirds before dawn. And with the full moon came a huge high tide that would be waiting for us when we reached the Fraser Delta later in the day—forcing ducks and shorebirds off the distant mudflats and into view. On top of that, Russell, Pete and Nathan had been busy scouting the route for difficult species and had a long list of sites where we could find some great birds. My watch alarm went off and we coasted down the road towards our first stake-out. Russell shone the flashlight up into an elm and onto a large stick nest where a Swainson’s Hawk had been sitting a couple of days ago. The nest was empty! Our hearts sank as we realized the bird must have just been holding the nest during the day before laying eggs and was probably roosting in another tree nearby. Not a good way to start, but it was only one species missed, so we kept our hopes up and drove to Robert Lake. Here we knew we’d find a nice variety of birds roosting close to the road, and this time we were not disappointed. A cluster of black-and-white on the shore became 5 handsome American Avocets in the binoculars—a species we wouldn’t see anywhere else along our route, and a Wilson’s Phalarope calling in the darkness was another bird that could be difficult to find. Heartened, we turned south and drove to Penticton to start some serious owling. Russell spotted a Great Horned Owl on a wire just north of Penticton, but the rest of us had to wait until our next stop to hear one. We bounced up the rough road past Max Lake and into the narrow valley famous for its Common Poorwills and Flammulated Owls. As we hopped out, the poorwills were calling everywhere (another bonus from the full moon!) but the distant hoots of a lone Flammulated took us a bit longer to hear. Virginia Rails and Soras called from the marsh and we were on our way again. By 2:15 a.m. we were at a Northern Saw-whet Owl nest along White Lake Road, where we managed to call up the local Western Screech-Owl as well. The sagebrush grasslands of White Lake were bathed in the moonlight, so we stopped briefly to add singing Western Meadowlarks and Brewer’s Sparrow. Next was the marshes at the north end of Vaseux Lake, where the moonlight serenade gave us Gray Catbird, Yellow-headed Blackbird, Marsh Wren and Song Sparrow. We moved along to another site where we hoped to call in a Long-eared Owl but didn’t have to—a female was howling at us as soon as we opened the door. And then a Pied-billed Grebe answered our imitations from the marsh. Things were going very well. 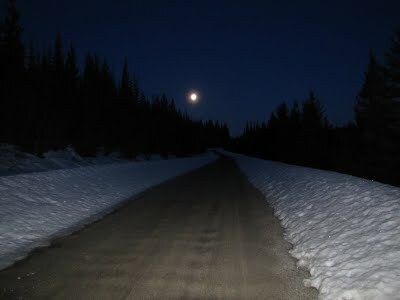 Rabbit Lake moon: 4:10 a.m.
We raced up the Shuttleworth Creek road to the western larch forests, the best spot in the south Okanagan for Barred Owl. A Ruffed Grouse drummed as we stood silently in the cold 3:30 a.m. air, but nothing answered Russell’s hoots. So we drove north along the main forest service road onto the high plateau. Boreal Owls are found in the spruce forests along here, but we weren’t confident of finding any this late in the spring, and came up empty again. The subalpine forests here were still in the grips of full winter, the road reduced to a single lane between high snowbanks and the small lakes frozen solid. We figured the dawn chorus here might be rather quiet, and we were right—American Robins, Hermit Thrushes, Varied Thrushes and a few Ruby-crowned Kinglets sang, but no warblers at all for the first hour. The Spruce Grouse made up for that, though, with a cacophony of clapping and clucking—usually we’re happy to get one or two but we must have heard close to 20! After a bit of effort we added the subalpine specialties—Boreal Chickadee, Pine Grosbeak, Gray Jay, American Three-toed Woodpecker, Lincoln’s Sparrow. By 5:30 a.m. we were back down in the larches to rack up the woodpecker list, and quickly got Pileated, Black-backed, Hairy, Downy, Northern Flicker, Red-naped Sapsucker and Williamson’s Sapsucker. We hooted again for Barred Owl, but only managed to get a big female Cooper’s Hawk riled up. The big surprise there was a Solitary Sandpiper Russell spotted in a meltwater channel—I guess it was waiting for the higher marshes to thaw. At 6:30 a.m. we drove downhill into the ponderosa pine forests, hoping to find Gray Flycatchers and other pine specialties. We did get Western Bluebirds, White-breasted and Pygmy Nuthatches, Calliope Hummingbirds and a few other species, but no flycatchers. That would mean a difficult decision later on. Farther down we saw two large birds in a tree—a Bald Eagle and a Golden Eagle! A Lazuli Bunting sang from the same spot, but the Lewis’s Woodpeckers weren’t on their favourite tree. At the bottom of the hill we added Lark Sparrow and Say’s Phoebe, and suddenly we were back in civilization at Okanagan Falls, where the garden birds were added thick and fast—sparrows, magpies, crows, starlings. Although we were trying to maximize our species total, we did make some extra effort for western species. We made a detour out of Okanagan Falls to find Northern Pygmy-Owl, but a staked-out pair seemed to have moved on, so we had to content ourselves with other western birds such as Hammond’s Flycatcher, Western Wood-Pewee, Western Tanager and Bullock’s Oriole. Than a U-turn and back to Vaseux Lake to begin our waterbird list in earnest. Redheads, both scaups, Ring-necked Duck, Canvasback, Ruddy Duck, Common Goldeneye and Common Merganser all scoped on the lake. A Veery—my first of the year—called from the birch woods, while White-throated Swifts chattered overhead. We went over to the cliffs and struggled to find a Canyon Wren that had been so obvious the day before but were happy to see a pair of Lewis’s Woodpeckers at last. Species number 117 at 8:00 a.m.—right on track. No Chukars called, though, so we continued south to McIntyre Bluff. Another detour there gave us Steller’s Jay and House Finch at last (phew), but no nutcrackers. Then a pair of Vaux’s Swifts twinkled overhead—another nice western specialty. At River Road we hoped to get Yellow-breasted Chat, but it appeared the cold spring had kept them farther south. We did hear a Bewick’s Wren, though, a new resident of the Okanagan Valley and now one less species to look for on the coast. Another sigh of relief as a family of Clark’s Nutcrackers called loudly from the pines on the hillside. Realizing we didn’t have MacGillivray’s Warbler yet—usually singing at higher elevations—we decided to check Inkaneep Park, a local migrant hotspot. But the woods there were silent except for a Black-headed Grosbeak and the insistent cu-coooo-cuk of a pair of Eurasian Collared-Doves. Two more western birds on the list! Then we had to decide whether to make the big detour up McKinney Road to get the Gray Flycatchers we missed earlier. Russell insisted we do it—only 18 extra minutes and a great western bird—why were we hesitating? So off we drove up hill, past the big Bank Swallow colony (check! 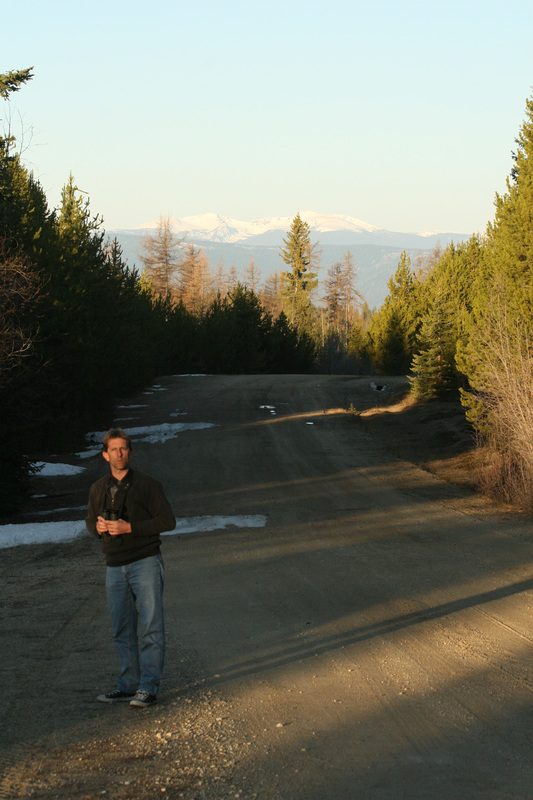 ), across the sagebrush flats and up into the ponderosas again. We rolled down the windows at the km-10 cattleguard and chelep!—we were turning around again and off to Osoyoos Lake. At Road 22 we stopped at a field to listen for a Grasshopper Sparrow heard the day before, but heard nothing but a Wilson’s Warbler from the bushes on the other side of the road (phew! Another missed warbler back on the list). No Peregrine Falcons were soaring over The Throne, either. We worked our way down the Okanagan River channel to a good Yellow-breasted Chat location, but couldn’t hear any of their distinctive whistles. Luckily a Least Flycatcher was calling from the cottonwoods there—a very good bird for this area in mid-May. Back at the fields we scanned for Long-billed Curlews and Bobolinks and Pete quickly found both. Just as we were getting back in the car I heard a distant series of whistles—chat! We left Osoyoos Lake at 10:30 with 145 species in the bag. A little behind schedule and a little behind on the species list, but nothing really to worry about. We now turned west—the strategy here was to stop as little as possible over the next 400 km to maximize our time on the Pacific coast. As Pete was phoning in an update to Rob Butler, who was blogging about our progress, someone shouted “KINGFISHER!” and there were two shaggy-headed birds on the wire. Sighs of relief all round. A trio of Harlequin Ducks flying up the river were a nice addition as well. We stopped briefly at the Princeton sewage lagoons to pad our teal list, but the only new bird there was a brilliant male Mountain Bluebird. We kept watching the river rocks for American Dippers, but hadn’t seen any by the time we reached Manning Park, so I decided we should check the Similkameen at the Boyd’s Meadow trail. The trail was deep with snow, though, so we let Pete run on while we walked, listening for forest birds. Pete quickly reported that it would be too far to go to the bridge, but we did have a Pacific Wren singing so didn’t leave empty-handed. Sumallo Grove was next—the gate was inexplicably closed so we had to run along the road into the forest of huge cedars and Douglas-firs. Chestnut-backed-Chickadees, Brown Creeper and Red-breasted Sapsucker called as we ran, so we were happy to leave with most of our targets. Then it was freeway driving into the Fraser Valley. We took the Hunter Creek exit and quickly added Black-throated Gray Warbler, then on to the Fraser Highway for a more leisurely drive through the rural bliss of a sunny spring day in the Lower Mainland. We kept the windows down and were rewarded with the sputtering calls of Bushtits in south Surrey. Our next major stop was the White Rock Pier, where Nathan had scouted some very nice seabirds over the past week. Although it was a Wednesday at 4:30 in the afternoon, the seashore was crowded with sightseers enjoying the sun and the stunning views of snow-capped mountains. We threaded through the crowds as we ran out to the end of the pier with our scopes and tripods, but it was well worth the jog. We added nine new species in quick succession, including a couple of Parasitic Jaegers that Nathan had lined up for us—a hard bird to find on the BC coast in spring. We still needed a few forest birds, though, so we stopped in at Sunnyside Woods and found Pacific-slope Flycatcher and Purple Finch. No Hutton’s Vireo, though. 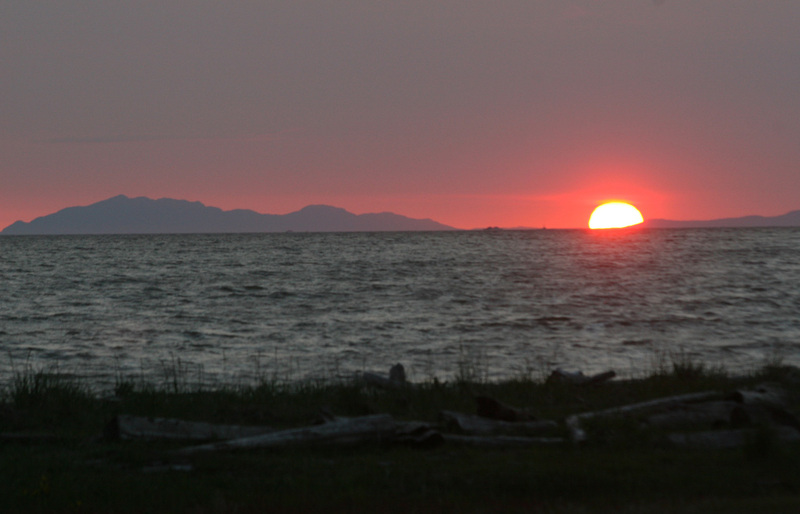 We were pinning our shorebird hopes on Boundary Bay, and Blackie Spit in particular. And it came through with flying colours—a mixed flock of shorebirds greeted our scopes with Black-bellied Plover, Red Knot, Dunlin, Whimbrel, Sanderling and Western Sandpiper. Elated, we decided to take a detour to Colebrook Road where Nathan had seen some good birds the previous week—Blue-winged Teal, Green-winged Teal, Lesser Yellowlegs all added in quick succession. Suddenly our goal of 200 species was within grasp. We had 179 species and it was only 6:00 p.m.—there were three more hours of light. We scanned the shore of Boundary Bay at the foot of 96th St. and our luck continued: six new species including a Merlin that rocketed by as we returned to the car. A check of a nearby barn netted a Barn Owl. Then it was off to Pete’s territory, the border town of Tsawwassen. He drove us down a residential street near his home, then stopped and said, “Play the Hutton’s song”. Russell teed up his BlackBerry, but nothing answered and after some quizzical looks from the neighbours we decided to give up. Just as we drove off, though, a Hutton’s Vireo began to sing loudly from the hedge. It always pays to keep your windows down! An overlook high above Georgia Strait produced Pelagic and Double-crested Cormorants, Pacific Loons and a pair of Black Scoters—then, as Pete had predicted, a male Anna’s Hummingbird. It was only 5:20 and we had 193 species—the goal was tantalizingly close. We went as far west as we could go in Tsawwassen, out to the end of the ferry terminal jetty. Black Oystercatcher and Brant were easily visible, and a quick scan of the south breakwater (only metres from the USA border) produced Brandt’s Cormorant and Pigeon Guillemot. Then off through the farm roads to Brunswick Point where Pete had been watching a small lingering flock of Snow Geese—and there they were! A quick stop at Canoe Pass to see one of the local Mute Swans turned into a few anxious minutes, but at last we spotted one of the birds—and with that had beaten Russell’s record of 197 by one species. We were tempted to drive down the road to Alaksen National Wildlife Refuge to get Barred Owl, but Russell wisely pointed out we could do that after dark, and we had to maximize our daytime effort. So we turned north and drove under the Fraser through the Massey Tunnel, then out to the Vancouver airport and beyond to that Shangri-La of birding, the Iona Island sewage lagoons. The sun was going down in a proverbial ball of fire as I turned my attention to scanning the nest-boxes for Purple Martins. The others searched the marsh for any sign of the Black Tern that had been here for a few days. We struck out on both species, so as dusk fell we went into the sewage pond area. Pete and I flushed a big sparrow from the trail—Golden-crowned—number 199! Then we checked a small flock of Canada Geese and saw the tiny Cackling Goose that had been hanging out with them for the past while—number 200! Elated, we ran over to the river for one last look at the martin boxes—nothing. Russell suggested we take a different route back in case we flushed up some Long-billed Dowitchers, and seconds later his prediction came true. Three dowitchers flew up, giving characteristic “keek!” calls, while another one remained back so we could study it in the lights of the sewage plant. With the record firmly in hand, we drove back down to Delta and onto Westham Island to look for the Barred Owls that were nesting near the Canadian Wildlife Service offices. 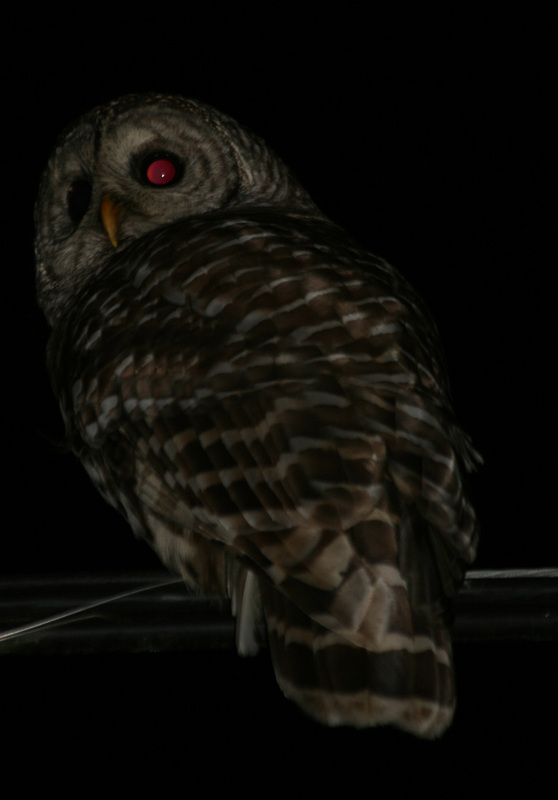 As we pulled into the parking lot, the headlights shone on a blob perched on the wire—an adult Barred Owl. From the trees nearby a young owl hissed. It was 10:30 p.m. and we had 202 species—time for bed. Wow! What a day of birding! Congratulations on breaking 200!